Interpretive markers near the entrance to Spotsylvania Battlefield at Laurel Hill. Source: NPS, Rank among 367 National Park Units 2014. Humid and hot in the summer with mild winters. Typical Virginia weather with winters that are mild, but with snow possible. Photo above: Taken May 19, 1864 by Timothy O'Sullivan of Grant's army, the 5th Artillery Reserve, at Spotsylvania. Photo courtesy Library of Congress. 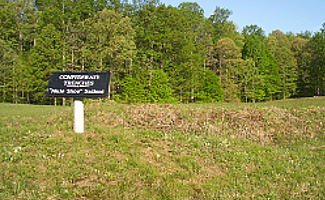 Above Image: Confederate trenches on the opposite side of the Bloody Angle at the Spotsylvania Battlefield. May 8-12, 2014 - They'd just fought a hard slog in fire and thickets a few miles north in the Wilderness several days before, but this was a new era in the Civil War, an era where General Grant would not let the enemy walk away. So now, only those few days later, it would happen again, in a land a bit more hospitable to large armies, but in a warfare many think more applicable to a World War in the next century. It would be fought in the trenches, in a salient I still can't get my head around as to why Lee thought it was a good idea. As the anniversary celebrations of the 150th moved south and east as well, what struck me most about the change in scenery and the nature of the battle and the land it would be fought on is ... the silence. As much as the fields of Spotsylvania were a cacophony of battle sounds for a week or more in 1864, today, the fields most days sit in reverent silence. Photo above: One view of the Bloody Angle today. Yes, you can feel this at other national parks, particularly at dawn or dusk, when the quiet nature of the land today distills a kind of calm awe as to what went before. And for those of you who've been at this battlefield before, or at the 150th, or are yet to come to Spotsylvania, take an hour or so at dawn or dusk, when almost nobody is on this remote battlefield and listen, and imagine, and pay tribute to those who fought there. It's an awesome experience wrapped in silence, something I've heard others remark about as well. 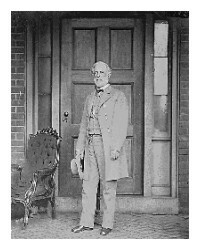 The beginning celebrations of the Wilderness and Spotsylvania 150th began on a platform and folding chairs inside that salient of General Lee, and you can even get a sense of that reverence and silence even while the speakers, including park historian John Hennessey and author James McPherson begin to tell the tale. See the video below for a capsule of those moments. And after all of the battle walks that occurred over the next two weeks describing the details of the cacophony of war, it would end in a simliar location with a procession at night and with 22 hours of a silent vigil by park staff. Yes, back to that silence, that reverent silence that tells so much about the story of Spotsylvania and its battle and its battleground, that you just must some day visit at dawn or at dusk and feel for yourself. May 8-12, 2014 - It's hard to put into numbers the amount of spectactors who visited the anniversary. It's hard to see one hundred yards in front of you through the woods here, let alone count. 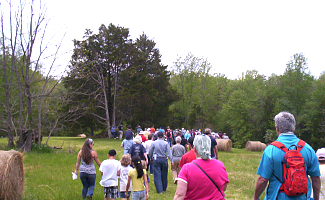 The battle walks were well attended, I'd venture a guess of 1,000 or so at the opening Saunders Field at the Wilderness real time event and those at the Bloody Angle at Spotsylvania. 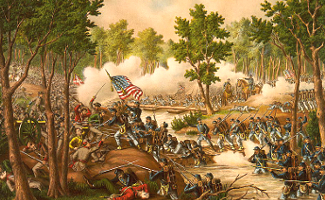 The Battle Rages - Depicted in the lithograph by Currier and Ives above is the battle at Laurel Hill, site of the first combat, a surprise meeting, of the Spotsylvania Battlefield on May 8 and again on May 10. This area is not on the Driving Tour map. It is located to the southwest of the entrance to the park. 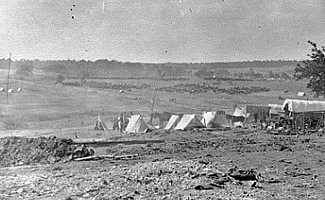 The Army in Battle Camp - In a photograph on May 19, 1864 by Timothy O'Sullivan (photo below left), you can witness Grant's army, the 5th Artillery Reserve, at Spotsylvania as Lee continued to dig in the new line of trench earthworks until Grant would leave the field on May 21. 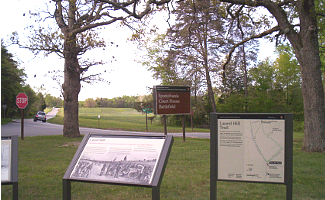 Laurel Hill - The markers (photo left column) near the entrance to the auto tour of the Spotsylvania Battlefield tell the story of the opening clash between the Confederate and Union armies on May 8 and later May 10. The area ahead down the lane takes you to Laurel Hill. Be careful when crossing the road. Although not on the auto tour, it is very close to Tour Stop 1 and the Exhibit Shelter, which is staffed during the summer. Ask the ranger there about Laurel Hill. The Salient and Bloody Angle - In twenty-two hours of fighting, the Bloody Angle saw an onslaught of trenched warfare from 6 a.m. on May 12 to 4 a.m. the next morning. Walk the paths here (they are constructed with faux recycled plastic ... not sure why, but they remain passable in wet weather), either by yourself or on a battle walk and learn the stories of the brave men from both the North and South who fought this arduous and most famous of the fights at Spotsylvania. This was hand to hand combat here and some of the most ficious of the entire Civil War. Confederate Trenches - As you drive around the park road what you'll become even more amazed at, is how large the Mule Shoe Salient that Lee constructed was. The photo top above shows the opposite side from the Bloody Angle, perhaps a mile from the other side. Imagine one hundred and eight thousand or so men in combat across this area. 1. A Celebration and a Vigil. Yes, it's too late for you to take part, but not too late to ponder. The opening ceremony was a great example, as mentioned above and pictured below, of a reverent reflection on the heroism and deeds of two battles that would shape what the United States is today, and that is, ... whole. The vigil by park rangers to stand in silence for the entire twenty-two hours of the attack at the Bloody Angle on May 12 was a remarkable idea and task to pay tribute to the men who fought there. 2. The Battle Walks. There were so many battle walks during the days of the celebration, many in real-time, it's hard to pick and choose. From the walks at Laurel Hill, which does not get interpreted often during the regular season to those focused on building the Salient to the amazing stories of the regiments and brigades of both armies as they fought at the Bloody Angle. Although we note in our opening paragraphs the value of visiting Spotsylvania at dawn or dusk, taking a Battle Walk by the historians at Spotsylvania provide a perspective that's impossible to do on your own, even with the most knowledgeable layman on the topic of Civil War. The Spotsylvania battlefied is remote, but does conduct tours during weekends from the Exhibit Shelter to the Bloody Angle. 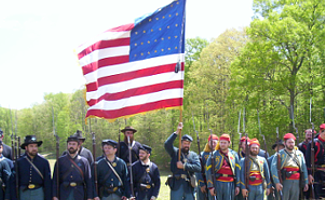 May 3, 2014 - Check out the videos from the National Park Service, including the Opening Ceremony for the 150th Anniversary Events of the Battles of the Wilderness and Spotsylvania. 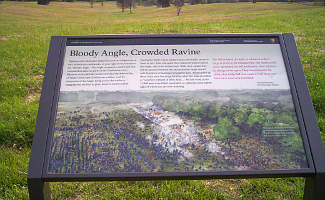 Interpretive marker at the Bloody Angle, Spotsylvania battlefield. 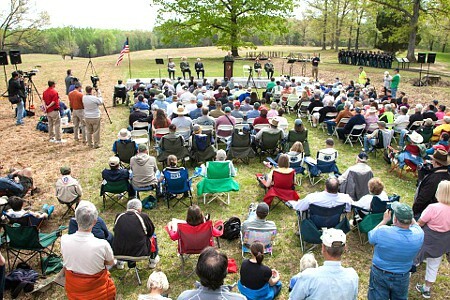 Opening ceremony of the 150th Anniversary of the Battle of the Wilderness and Spotsylvania, held at the Bloody Angle, Spotsylvania. More interpretive markers with monuments in the background at the Bloody Angle, Spotsylvania. Reenactors taking part in the Wilderness and Spotsylvania 150th Anniversary celebrations. Even if you missed the special events of the 150th anniversary during the first weeks of May 2014, you can still create your own. The Wilderness and Spotsylvania sections of Fredericksburg and Spotsylvania National Military Park is there for the taking year round. They are in remote areas of the park itself and neither have a visitor center (there is one at Chancellorville about five miles away). Both have exhibit shelters that are staffed on weekends. You can wander around them at your pleasure, but I'd suggest stopping at the Chancellorsville Visitor Center and finding out when a battle walk was scheduled. At the present time, both sections have guided tours on weekends. That'll help fill in a bunch of the gaps you have when you go there. Ellwood Manor, which served as a Union headerquarters is open daily starting April 28 for the summer season; there are weekend guided tours. 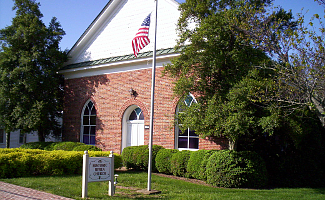 You should also take an hour or so in the town of Spotsylvania Court House. A small walking tour takes you to period buildings, plus a museum. One of the period buildings in the small town of Spotsylvania Court House, near the Wilderness and Spotsylvania battlefields.